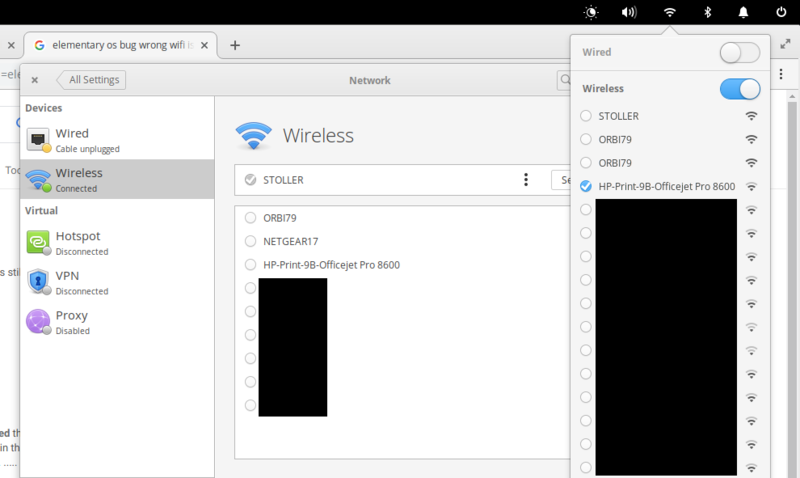 When looking at the list of wifi networks in the menu bar's wifi icon it seems to show (as indicated by the check mark) that I am connected to a network that I am not actually connected to. The system settings' network page shows the correct network though. Also the list of available networks is much longer when accessed through the menu bar vs. the system settings. Are these known bugs / expected behaviors? If you notice this happening repeatedly consider filing an issue at the relevant GitHub repo so that someone can investigate: https://github.com/elementary/wingpanel-indicator-network. After checking, there is already one confirmed issue filed as high priority here: https://github.com/elementary/wingpanel-indicator-network/issues/111. Not the answer you're looking for? Browse other questions tagged wifi release-juno networking or ask your own question.